The American Association of Orthodontists (AAO) recommends that all children have a check-up with an orthodontic specialist no later than age 7. 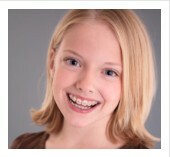 The orthodontists goal is to provide each patient with the most appropriate treatment at the most appropriate time. Sometimes early or interceptive treatment is indicated to minimize or even prevent problems that can occur as the teeth erupte. Orthodontists specialize in treatments to prevent or reduce the severity of developing malocclusions by maintaining the quality of an otherwise healthy developing oral structure. When an issue is noticed earlier, treatment can be shorter and less expensive compared to future developments that are left untreated. Occasionally a primary tooth does not fall out when it supposed to or simply does not fall out on it’s own at all. In these cases, the permanent tooth may grow in the wrong position because the primary tooth has not been pushed out of the space. If this happens, it may be necessary to extract the primary tooth to allow the proper eruption and spacing of the permanent tooth. Thumb sucking can cause the upper teeth or jaw to tip forward and can result in a serious overbite that requires extensive orthodontic treatment. With the use of a dental appliance that discourages thumb sucking, future costly orthodontic treatment may be prevented.